Drink Smart! Never Drink Without It! We understand that the average supplement consumer has been deceived many times when it comes to supplements and their efficacy. We spent 3 years formulating Neutralize, and we believe in our product so strongly we are willing to give out free samples to prove to our future customers that Neutralize works. Neutralize reduces acetaldehyde, which is the main carcinogenic metabolite resulting from alcohol (ethanol) consumption. As a matter of fact, a key ingredient in Neutralize reduced acetaldehyde by 100% after 50mls of alcohol (ethanol) was consumed by human subjects compared to placebo. 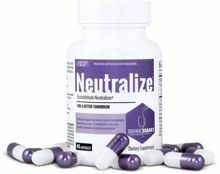 Neutralize was developed for consumers that are ambitious, health conscious and still want to have fun. Neutralize will not prevent intoxication. Ethanol, the molecule present in various alcoholic beverages, exerts its toxicological effects both directly and indirectly, via oxidation to a metabolite, acetaldehyde. This conversion/oxidation of ethanol to acetaldehyde occurs via alcohol dehydrogenase. Once acetaldehyde is formed, it is further oxidized by yet another enzyme, acetaldehyde dehydrogenase, into acetic acid. A: Take Neutralize as soon as you remember. Q: If I forget to take any Neutralize until after my last drink, should I take both servings? A: Yes, in cases where you haven’t taken Neutralize until you’ve finished drinking, take 2 servings (6 capsules) at once. Q: Will Neutralize increase tolerance to alcohol or prevent intoxication? A: No. Neutralize helps support your body’s normal acetaldahyde elimination process. Q: Will Neutralize prevent liver injury associated with alcohol consumption? A: Neutralize is not intended to treat or prevent any disease.